Provides Telefónica Customers Advanced Cybersecurity Monitoring and Protection Services Through Devo Data Operations Platform. Madrid- Thursday 14th of June, 2018. ElevenPaths, the Telefónica Cybersecurity Unit, specialized in development of innovative security solutions, today announced a Strategic Alliance with Devo, the Data Operations Company formerly known as Logtrust. The Devo Data Operations Platform will provide ElevenPaths with end-to-end security monitoring and data management services to rapidly detect and effectively track Cyber incidents, and reconstruct incident time-lines with all forensic evidence securely stored in a central location. 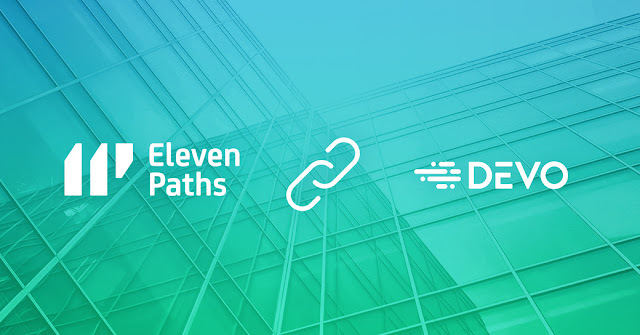 In addition, ElevenPaths services such as Clean Pipes and Web Application Firewall (WAF) will feature embedded applications built on top of the Devo platform for developing customer portals with real-time enriched dashboards. Security Monitoring - a self-managed service that provides customers with a comprehensive view of the security status of their cloud, IT and security resources, and enables monitoring through customized alert generation. Data Management - a managed security service that enables Telefónica customers to collect, store, search and analyze in real-time any IT, security, network or application log data, regardless of its size or the retention period. Devo, formerly Logtrust, is the leading Data Operations Platform for the digital enterprise. Devo delivers real-time business value from analytics on streaming and historical data to help Fortune 1000 enterprises drive sustained performance and growth. The Devo Data Operations Platform collects, enhances and analyzes machine, business and operational data from across the enterprise. Devo provides real-time analytics and insight for IT operations, security analytics, business analytics, customer insight and log management for the world’s leading organizations. For more information visit www.devo.com, or follow Devo on twitter @devo_inc. Telefónica is one of the largest telecommunications companies in the world by market capitalization and number of customers with a comprehensive offering and quality of connectivity that is delivered over world class fixed, mobile and broadband networks. As a growing company it prides itself on providing a differential experience based both on its corporate values and a public position that defends customer interests. The company has a significant presence in 21 countries and over 322 million accesses around the world. Telefónica has a strong presence in Spain, Europe and Latin America, where the company focuses an important part of its growth strategy. Telefónica is a 100% listed company, with more than 1.5 million direct shareholders. Its share capital currently comprises 4,975,199,197 ordinary shares traded on the Spanish Stock Market and on those in London, New York, Lima, and Buenos Aires.